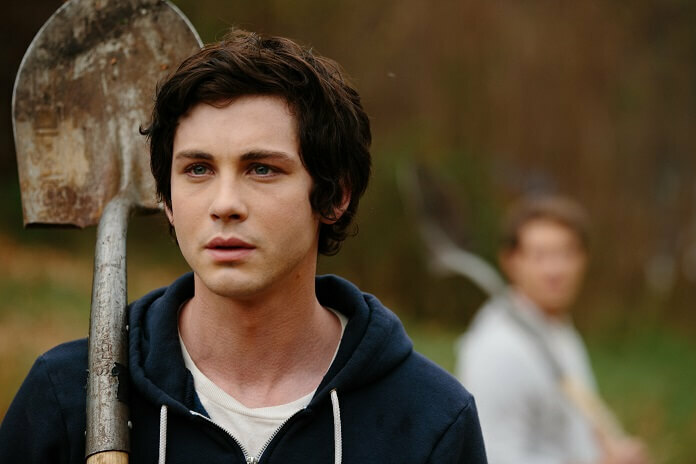 The Vanishing of Sidney Hall squanders an interesting premise and wastes the talents of Logan Lerman, Michelle Monaghan, and Kyle Chandler. Told in nonlinear form with flashbacks and flash-forwards differentiated by the style of Lerman’s hair, this R-rated mystery never fully commits to any particular approach to laying out the life story of the titular character. The Vanishing of Sidney Hall charts the life of a talented high school loner who, thanks in large part to a compassionate teacher, takes his talent for storytelling from the level of sexual fantasy essays to a bestselling, life-altering novel. The novel has an incredible Catcher in the Rye-level impact on its readers, yet Sidney (Lerman) seems incapable of feeling happy or fulfilled. Not even a potential Pulitzer Prize can brighten his dour disposition. Sidney has a whole nest of inner demons to battle and he attempts to face down each one during the film’s three timelines. The film ricochets between scenes of Sidney in high school, Sidney as a successful novelist in his 20s, and a slightly older and more cynical vagabond Sidney who looks a lot like a younger, disheveled Joaquin Phoenix. The film, written and directed by Shawn Christensen, leaves so many threads dangling that even at a two-hour running time it feels incomplete and rushed. Supporting characters pop in and out, with many putting in appearances that are not only unnecessary but also confusing. The large ensemble is, for the most part, given little to do. Only Logan Lerman and Elle Fanning’s characters have any depth to them, and even those make nonsensical transformations that are best described as contrived plot devices. Christensen gathered together a terrific cast, but then gave them a script with no meat on its bones. There’s simply nothing there for the supporting players to latch onto. Kyle Chandler appears as part of the older Sidney timeline and, without disclosing any spoilers, the justification for his character’s involvement in the story is one of the film’s most ridiculous assertions. The performances are fine, for the most part. Elle Fanning is great as the fresh-faced neighbor who wins Sidney’s heart. However, once her character ages into her 20s, Fanning seems less comfortable crawling into the character’s skin. Lerman also seems more at home as the high school student and budding writer who finds inspiration in his fellow students. Lerman’s in his mid-twenties, yet the teen version of Sidney is the portion of his performance that’s the most engaging. The Vanishing of Sidney Hall requires the audience to feel for the title character but doesn’t provide any reason to truly care about this person once he becomes a bestselling novelist. The one-dimensional characters who surround Sidney as he faces his demons also fail to engage the audience, leaving us with no one to really root for once the heart of the story is revealed.